From Katherine Fahey's Crow Song River. Crows - my favorite! This collection of crankies includes folk songs, a poem, a Native American folktale and a 16th Century Scottish piping piobaireachd. Baltimore artist Katherine Fahey premiered Crow Song River at the Baltimore Crankie Fest April 12th, 2014. Kaweah or Crow River Song is the story of a girl who is isolated from the world. She is afraid to leave her home until she is lured out of her safe space by the beauty and wonder of the world. She encounters some challenges on the way that drive her to strive harder and lead to an unexpected transformation. 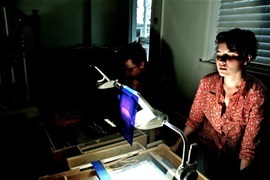 It is a "projected crankie" using two overhead projectors (see picture). She collaborated with a dancer and song writer. Read about it here. This was created by Sandy Buchner of Seattle, Washington! This Crankie uses an overhead projector and an acetate roll. 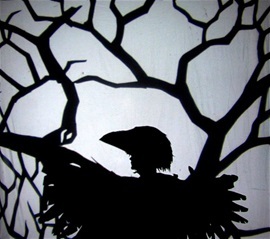 ‘As the Crow Flies’ is a story in the making, slowly inching nearer to completion. This roll was made during a residency at The Performance Centre in Penryn and is the teaser trailer for the longer story. Made by Hope & Anchor – Joanna Hope Bricher & Alex Goodman. Sound recordings by Samuel Rodgers and music borrowed from Billy Childish. www.hope-anchor.co.uk Alex is from Cornwall, UK and Joanna resides in Manchester, UK. THIS IS ONE OF MY FIRST CRANKIES. SKYE RICHENDRFER IS PLAYING AN ADAPTION OF A 16TH CENTURY PIPING PIOBAIREACHD ON THE SMALL SCOTTISH PIPES. THE TUNE MIMICS THE SOUND OF CROWS.